O.B. De Alessi is an award-winning filmmaker, visual artist, actor and writer from Italy living and working in Paris. 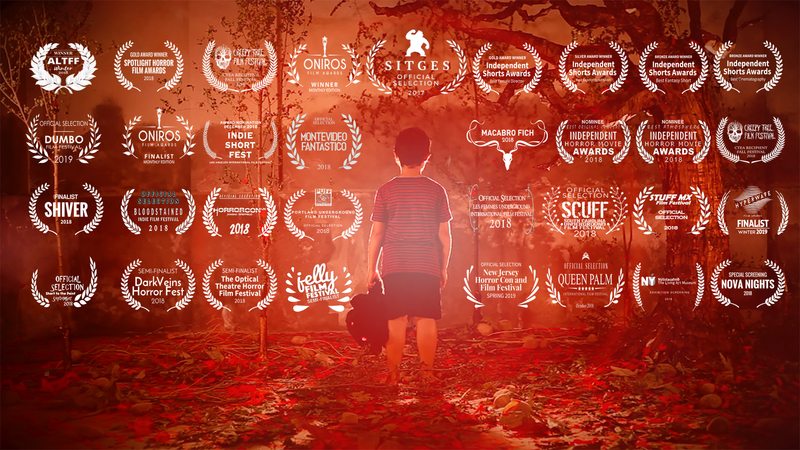 Her first short film, Kuo’s Eyes (2017) premiered at the Sitges International Fantastic Film Festival of Catalonia in 2017 and went on to screen internationally, receiving 9 awards and 5 nominations. O. B. has graduated from Chelsea College of Art & Design and from Central Saint Martins in London, where she moved at 19. Recent art exhibitions include NOVA NIGHTS #10 at the Horse Hospital, London, Interregnum at Soil Gallery, Seattle and The Primal Shelter Is Site For Primal Fears, The Living Art Museum, Reykjavik. As an actor, aside from occasionally starring in her own films, O. B. has recently had roles in Zac Farley’s and Dennis Cooper’s features Permanent Green Light (2018) and Like Cattle Towards Glow (2015). She has studied acting techniques with teachers such as Jack Waltzer (lifetime member of the Actor’s Studio) Sei Shiomi, Giles Foreman and Marilyn Fried. When making a film, O. B. combines together all the skills she has acquired through her studies and practice and this is what gives her the ability to create strong, unique projects. Michael Salerno, Director of Photography, is an Australian born artist and filmmaker based in Paris. He is runs the small press Kiddiepunk. Visit his website. Golden Fur, who composed the Original Soundtrack for Kuo’s Eyes, is an Australian chamber ensemble based in the USA, comprising Samuel Dunscombe (clarinets, electronics), Judith Hamann (cello) and James Rushford (keyboards, viola). Visit their website. Alan Jones, who worked on the sound editing and mixing, is a professional, detail-oriented musician and mastering engineer, specializing primarily in psychedelic, avant and experimental genres but catering to all. Visit Laminal Audio’s website. Alessandro Iacovoni, was born in Novara in 2007. He attends the fifth grade at Alexandria International School in Alessandria, Italy. Kuo’s Eyes is his first acting experience. Christian Bellomo trained at the Pochi Theatre School in Alessandria, Italy. He is known for Su Marte Non C’è il Mare (There’s no Sea on Mars) by Lucio Laugelli and Selezione Artificiale by Fabio Fossati. Marco Monty Ferrari obtained an acting diploma at the Pochi Theatre School in Alessandria. He participated in writing workshops with Giuseppe Tornatore, Carlo Mazzacurati and Doriana Leondeff. He later focused on studies for opera and musical theatre at the Verona Opera Academy (VOA). He has worked on productions with Le Settimane Musicali at the Olympic Theatre of Vicenza and at the Macerata Opera Festival. Since 2016, he is the executive director of the publishing house Vicolo del Pavone. Adriano Raia is eight years old and lives in Alessandria, Italy. Kuo’s Eyes is his first film, but he studies acting with actor/director Laura Bombonato and Gianluca Barbieri and has been on stage several times. Gianni Ferrari was born in Alessandria, Italy, where he lives. He studied acting with actor/director Laura Bombonato. Aristide and Sara De Angelo where born respectively in 2010 in Ouagadougou, Burkina Faso, and 2008 in Alessandria, Italy. They both study acting with Laura Bombonato and Gianluca Barbieri.